Choosing a college is a big decision — one that you won’t make without doing your research, talking to people you trust, and visiting the campuses you’re considering. Many schools fit their university experience into a short presentation, tour, and Q-and-A. While short-and-sweet campus tours are convenient, do you really want to commit the next four years of your life after just a four-hour visit (or less)? 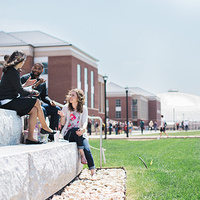 At Liberty University’s College For A Weekend, you can spend four days test-driving life as an LU student, exploring our more than 7,000-acre campus, and getting all your college questions answered. You’re anything but a typical student, so CFAW is anything but a typical college tour. Design your perfect college visit at Liberty University. Endless possibilities — all in one place. Enjoy our on-campus activities, including a concert by a top Christian artist, an NCAA athletic event, and so much more!